Considering a profession within the Navy should not come lightly (or any service for that matter), especially if you are not comfortable with ocean-going vessels (ships and submarines). The vast majority of Navy deployments are at sea on Naval ships and submarines, though there are many deployments since 9-11 that allow for Navy personnel to deploy to various ports and bases around the world and in combat zones filling joint military billets. Regardless, expect to spend up to a half a year or more at sea every few years. Depending on where you are stationed will typically determine the locations you will deploy. For instance, ships and submarines stationed in Norfolk VA will deploy throughout the Atlantic Ocean, the Mediterranean Sea, as well as around the Coast of Africa and into the Persian Gulf (depending on the regions with the most turmoil). 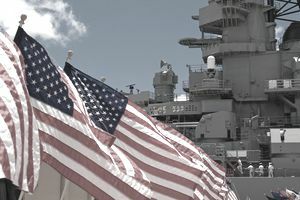 Ships stationed on the West Coast will deploy throughout the Pacific, visiting U.S. ports in Japan, South Korea, and Hawaii. With recent conflicts, ships from the West Coast, Pearl Harbor, and Japan will also cruise to the Middle East and into the Persian Gulf. If you are stationed as part of the air wing commands, you will deploy on larger ships but have a facility to do maintenance and daily work on a Naval Air Base like Oceana in Virginia Beach (outside Norfolk VA), North Island in Coronado CA, outside San Diego Naval Station. The larger ships (such as aircraft carriers) are small cities, with more than 5,000 sailors aboard. These are always deployed to areas where United States' interests are being threatened, so there is usually little time for port visits - though there are some. On a carrier or any ship for that matter pretty much every job there is in the Navy makes the machine work like a moving city. There are cooks aboard. There are medical personnel aboard. There are communication and computer specialists aboard. There are finance, administrative, and law clerks aboard. There is pretty much every single Navy job aboard. If you join the Navy, you're going to spend some time deployed at sea. There's no way around it. Of course, some ratings (jobs) spend more time deployed at sea than others. Examples would be aircrew and aircraft maintenance, sonar technicians, boatswain mates, and more. There is a very small group of people in the Navy who deploy quite often, but not necessarily on ships. They may be flown into a region and fast rope or parachute onto a ship for a temporary stay to perform a special operations mission, but the members of the Navy SEAL and Navy EOD units tend to deploy to forward deployed bases around the world where and when needed. Sometimes these quick deployments may last only a few weeks, or their forward deployed and travel status throughout a region are typically 6-9 months long. These deployment cycles are similar to ships and submarines, however, the members of the special operations community just do not stay on board ship or submarine for too long. If visiting a ship or submarine, they will be flown, drive their zodiacs, mini-submarines, or swim to shore depending upon the mission. Most Sailors are assigned to ships or submarines for three year periods, followed by three years of shore duty. That does not mean they will be deployed to sea for the entire three years that they are assigned to a ship or submarine. The ships and subs also spend a significant amount of time docked at their home port for regular maintenance for both machine and crew. Most ships deploy to sea duty for months at a time (usually for six months, but up to nine months). Then they return to their home port for four or five months (during which time there will be several one or two week cruises for training purposes). One great thing about coming back home to port is you will always be near a beach town. This is something else to consider when thinking about joining the Navy. Just because you are on shore duty assignment, doesn't mean you won't get deployed or travel to other bases around the world. The Navy will require both volunteers and non-volunteers (about 10,000 Sailors per year) to do Individual Augmentee Duty. Those selected work outside of their regular Navy job, and are deployed to Iraq and Afghanistan (usually for 12 months) to assist the Army and Marine Corps with combat missions and patrols. What Are the Job Duties of the Navy's Fire Control Technician? What Does a Navy Hospital Corpsman Do? What Does It Take to Be a Navy Mineman?